As you have probably surmised by now, the bike tour has been on hold for the last few months. In previous posts, Facebook and Twitter, I shared the story of stopping the tour in Deming, NM to bring my youngest son (Jordan) home to San Antonio. He was suffering from what we believed to be a severe case of altitude sickness. Lower altitude and some wellness visits over two weeks saw an improvement, but a milder form of the headaches and occasional nausea lingered. Finally on May 7th a CT Scan of his head showed us something very unexpected. There was a mass in his brain which was not allowing the fluid in his brain to drain normally. Which was why he was sensitive to the pressure at high altitudes or the increased barometric pressure when a storm was approaching. We were told to rush him to the ER where bloodwork and more scans were done. He was quickly ushered up to Neuro-ICU and from that day forward the entire focus has been on his recovery. We later discovered the mass in his brain was a Germ Cell Tumor. His particular diagnosis was Pineal Germinoma. It is not common for germ cell tumors to happen in the brain, but the good news was a treatment plan of chemotherapy and radiation has a 90% cure rate. As far as tumors go this was great news. So, for the months of May, June and July, Jordan received chemotherapy treatments in hospital. Then after a 3 week break he started on out-patient radiation treatments in late August. The last 6 months have been a time of extremes. The whirlwind of medical terms were overwhelming. Making life decisions based on the little we understood on little sleep and coffee. 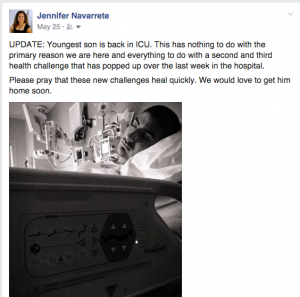 Once he was stabilized they began chemo treatments. Which in and of itself is physically demanding. Then the hospital infections set in. We faced one crisis after another all for being in the hospital. To say we were frustrated would be one of the biggest understatements yet. Then 30 days after it all began he was all enough to come home. It was great to be out of the hospital, but Jordan was so weak from all the infections he contracted while at the hospital. The biggest kicker to it all was that none of the infections had anything to do with his brain tumor. You’ve heard the saying, “The longer you stay in the hospital, the more likely it is that you will stay in the hospital” well they aren’t kidding. Overall, it was a nightmare. However, there were bright spots in the long ordeal. We did have some good nurses who were dedicated and compassionate. However, there were also nurses who were “phoning it in”. The rub is that all it takes is one of the “phoning it in” nurses to derail your health. I won’t name names, but I totally should. If you followed my story on Twitter and Facebook, then you already know which hospital facility is the culprit. Needless to say we transferred his care to another hospital, University Hospital. This is where Jordan’s care took a huge uptick. We were gun-shy after our last experience. So, when it was time for round two of chemo, we were preparing for everything to go wrong. Guess how many things went wrong? None. Not a single thing. We were amazed. You mean Jordan could go in for chemo for the brain tumor and NOT wind up with every kind of terrible infection under the sun that has nothing to do with what he was getting treated for? Wow. We were thrilled with the care Jordan received form the entire medical team at University Hospital. His third and final round of chemo went off without a hitch as well. The care Jordan has been receiving from University Hospital and CTRC (Cancer Therapies Research Center) has been absolutely wonderful. Then it was time for radiation treatments. The oncology teams at CTRC led by Dr. Andrew Brenner and Dr. Richard Crownover were kind, caring, patient and highly knowledgeable. They answered every question and gave us lots of information on his radiation treatment as well as potential side effects. Then one day in a much quieter and more pleasant fashion than it all started, Jordan’s treatments were over. 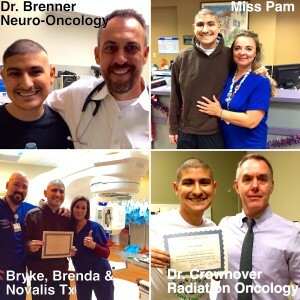 He received a Radiation Treatment Graduation Certificate and we celebrated. The weight of the world seemed to lift off our shoulders. We felt light, airy and we couldn’t stop smiling all day. We have been told it will take some time for his body to fully heal and recover from such a traumatic ordeal. Which makes sense. What happened to Jordan didn’t happen overnight. Nor did the chemo and radiation treatments. In the meantime, we are very happy to keep our lives simple and quiet. Allowing him all the time he needs to heal. Through the whirlwind of medical activity, we were blessed to have so many of our friends both in person and online praying and sending Jordan positive vibes. We felt the outpouring of love during many of our most challenging times. Support from the time he first entered the hospital to encouragement during the frustrating weeks of hospital complications to cheering him on when he finally was able to come home. We are extremely grateful to our immediate family. They prayed, laughed and cried with us during all the highs and lows. Their love and support are the rock from where we have drawn our strength. Overall, Jordan and I feel humbled by everyone’s care, kind words, cards in the mail, tweets, Facebook posts, texts and calls. Just to know you were thinking about us, even when we have been so withdrawn from the world, warmed our hearts. A special word of thanks to Penny Muckleroy who is an independent distributor for USANA Health Sciences and Amy Aubry who is an independent distributor for Young Living Essential Oils. The nutritional supplements and essential oils they provided Jordan over the last six months were of great comfort. I wish I could elaborate on this more, but for regulatory reasons can not. I will say that I highly recommend speaking with both of these ladies and not just because I am also associated with both companies. What Ever Happened to Roger and Susan? 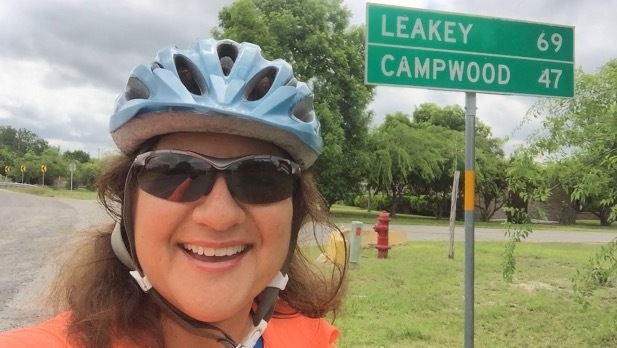 What’s Next for the Health Fitness Beauty Quest Bike Tour? Let’s backtrack a bit to early May: During the time we were in San Antonio before we found out about the tumor in Jordan’s head, Roger and Susan were pedaling their way through Texas. Since they were in Texas and approaching my neck of the woods, I attempted to rejoin them in Brackettville, TX. However, on the day I met up with them, Roger was admitted into the hospital in Del Rio. He wound up canceling the rest of the tour due to health complications. That left me riding the tour solo fully loaded from Brackettville, TX to Boerne, TX. I rode 4 days for a total of 120 miles. Not too shabby for riding loaded with all my gear for the first time. Look for a detailed post of the ride from Bracketville, TX to Boerne, TX in an upcoming post. Flash forward to today. With so much uncertainty over the last six months, I wasn’t sure when I could seriously look at continuing the tour. I knew there would be a point when I would be back on the road. My current estimate is an April 2016 Health Fitness Beauty Quest Bike Tour Part II restart. There are a couple of options: Begin where I first left the tour and make up the miles from Deming, NM to Brackettville, TX. The idea would be to find a group riding the Southern Tier and join them in Deming. Another option is to pick up the tour from my last ride point of Boerne, TX and then make up the missing Deming to Bracketville miles in Florida by cycling down to the Florida Keys. I’m sure you can guess which option sounds more appealing. I will share details as tour plans come together. So, that is the last 6 months in a single post nutshell. Thank you for continuing to follow the journey and supporting us during such an unexpected detour. There is still so much more to come. Cheers!